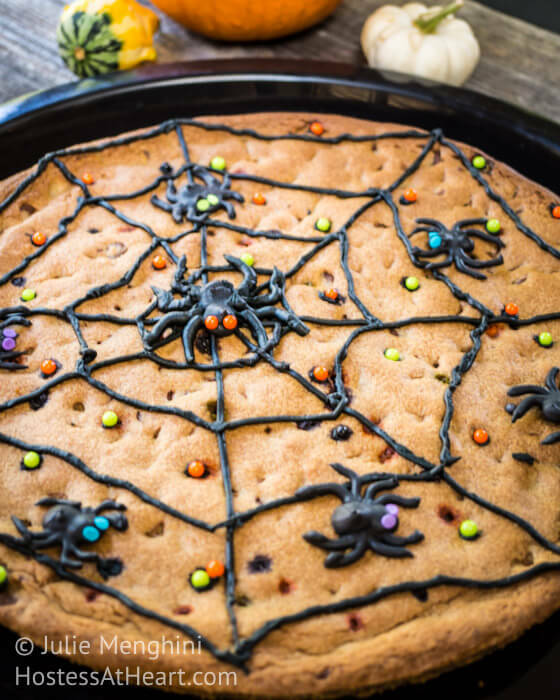 Cookies are always perfect for entertaining, and everyone will love this Halloween Cookie! It’s a fun activity to involve the children in too. I have always loved Halloween (insert disclaimer here). I’m a big chicken when it comes to the haunted houses or scary movies. I don’t want my heart leaping out of my chest or listening for every creak in the house, imagining that Freddie Krueger snuck in while I was gone. That said, no one would be afraid of this Halloween Cookie. We had some friends over for a BBQ, and that gave me a great excuse to make a spooky creepy crawly treat. Actually, these little spiders didn’t scare anyone, and they were fun to make. My inspiration was from That Skinny Chick. 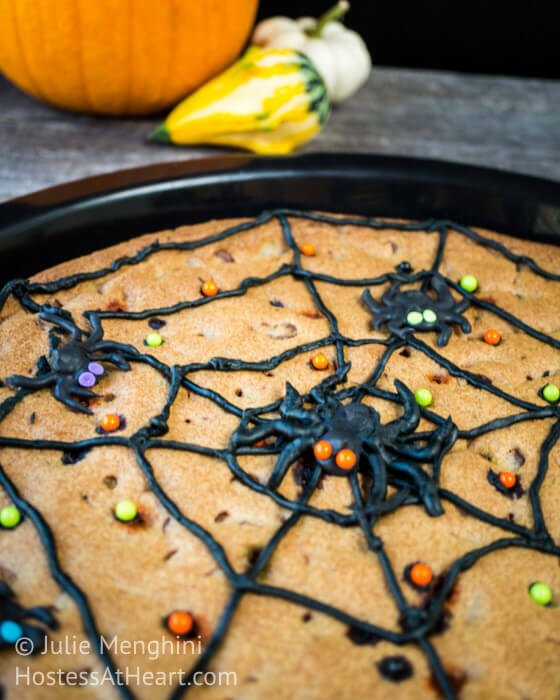 [Tweet “This Halloween Cookie is perfect for your entertaining.”]For the spider web and the large center spider, I used a pre-made frosting with a decorating tip built in. I found it very difficult to work with, and I lost a lot of control because the consistency of the frosting wasn’t the easiest to work with. The perfectionist me was disappointed that my spider web wasn’t perfect. I also placed little colored balls on top of the raw cookie dough, but most of them sunk while baking, so I just put new ones on top of the cookie after it cooled a bit. Adapt and conquer I say! For the little spiders, I used a royal frosting (click here for recipe) and made these little spiders on a piece of wax paper with a photocopy spider on the underside. Once they set, I carefully transferred them to the cookie. Also, let the cookie cool completely before you let those spiders jump on. This project would be perfect for the kiddos. They can add candy pieces, candy corn, or some fun sprinkles. This cookie would also be welcome at your Halloween party! Are you making any Halloween goodies? I would LOVE to see them, so give me a shout out! Thank you Dini! That spooky drink you made was amazing! Thank you Ana! He is kind of staring at you isn’t he? 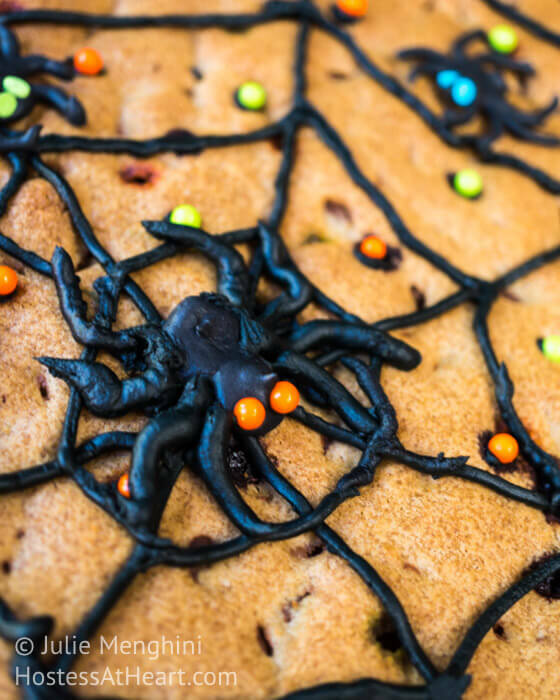 I think you did a terrific job with your cookie…love the eyes on the spiders. Thank you Karen! You’re so sweet, and I appreciate you stopping by! Your cookie is so much fun, Julie! I think your spiders look great. I love their eyes. I bet your guests loved it! Thanks for sharing such a cute idea. Thank you! I hope you will have cookie time with your munchkin. The memories last forever! Thank you Dawn! Let the big boys watch the spooky movies. We can make cookies! Arguably the best halloween cookie I ever saw. Very innovative! Thanks Lily! It was a lot of fun. You are so sweet! If you have a pizza pan that will work, or you don’t even have to make it round! Enjoy your weekend! Cynthia, I can’t seem to comment on your delicious burrito bowl? I pinned it but do you have the comments turned off on your blog? Yay!!! There’s my Halloween post! Julie this is so cute!! I love how kid friendly the treat is too. I must admit, that I’m not one for horror movies or anything like that. In fact, in elementary school we went on one of those haunted hay rides where they steal a kid out of the back of the hayride. Of course, I didn’t know it was planned, and I was so scared I was going to be next. Anyway, thanks for sharing and bringing this treat to the fiesta. I hope you have a fun weekend ahead! Thank you Kaila! I am a Halloween weenie when it comes to being scared. That hayride would have had me cowering in a corner! Hope you are having a wonderful weekend too! This looks so absolutely soft and flavorful! I definitely need this in my life for Halloween! I mean, who doesn’t love a big cookie, you know? Yea!!! With Ice Cream!!!! Thank you, and enjoy your weekend! Thank you Linda! Sweet creepy? LOL my children would loveeeee that cookie! I just love your Halloween cookie. It is so cute! Love, love, love Halloween – it was the best holiday to spend with the kids. Cute “cookie” but I dislike, dislike, dislike any form of spider “dead or alive” in my home.Ha! Ha! Now, in the garden they are more than welcome. Thank you Judi! The spiders are huge this year! I really get creeped out walking through them. Yikes! Have a great day! The “outdoor spiders are not bad” because I have (had) bats eating them. Unfortunately a bat got into my home (that was an experience) so I had to hire Critter Control to seal off the possible entrances – all 15 – I have one of those fancy roofs! The bats were eating them I’m sure and I bet the spider population will be big next year. Ha! Ha! Besides all that you did a great job on the cookie – kids especially will love it! I would FREAK out if a bat got in! I do have a friend that is getting pretty good at catching them in his house though. I would rather have spiders than bat droppings! Thanks for the cookie love. I hit it with a spatula and put it in a garbage bag and took it ouside. With the second one I knew I had a problem, closed the bathroom door, put a towel under the door so he could not get out and called someone to get it!!! LOL! You hit it with a spatula? You are my hero Judi! Ha! I actually like the detailed stuff. If it wasn’t for the waistline, I would do a lot more cookies and cakes. Ha! I shy away from that stuff like the plague. It doesn’t help. I make up for it in different areas…lol! I love this it looks so cool! I am not a fan of scary stuff either! My kids would love to make this with me! Can’t wait! ha ha a lovely idea and beautiful post!!! Loved te details on the cookie. Thank you Sonal! They love scaring mom too! Oh me too, I love Halloween and love your cookie. It’s perfect. This is my favorite time of year. The cookie is decorated so beautifully I just love it. Thank you Suzanne! I like to think of it as rustically fun. Woooooooooo, you scared the pants off me Julie with your almost “real” spider look! Wow, perfection, even though you didn’t think so. I was never a fan of Halloween, having never grown up with it, but when my kids were younger, we’d enjoy having little block parties and we’d cook everything from scratch for the neighborhood kids, we’d sew our costumes etc. Now it’s back to just the 2 of us, so I don’t really celebrate it. But wow, you sure are doing a great job, bet all the neighborhood kids love visiting you. I do love this time of year though with the pumpkins and seeing porches decorated. I’ll never forget my first visit to the USA was a business road trip from Montreal to Saranac Lake, NY. As we went by all the houses, I couldn’t understand what all the pumpkins, gourds, mums and cornstalks were about, I loved it all. Now it seems Halloween is celebrated around the world :)) Oooops, didn’t mean to take your entire board LOL! Ha Loretta you make me laugh. I am sure it is a weird tradition for people to see. As a kid, it was one of my favorite times. We didn’t have much for costumes, and often put together what we had. Ghosts and bums we common. But the candy and being out in the dark! What fun. I do love the fall decorations too. They are so warm and earthy. I do love working in the kitchen with the little neighbors. They have a ball too and I think their mom enjoys the break. Can’t believe it’s Halloween time already Julie. Looks like yesterday 🙂 Your cookies kick started the season amazingly. Thank you skd! It’s just a lot of fun for me. Enjoy your day!